Crossing the vast blueness of the North Pacific’s oceanic divide, a teenaged Yoskay Yamamoto relocated in the mid-’90s from his hometown in Japan to the culturally different California. Feeling alienated within his new surroundings, the young Yamamoto discovered a new appreciation for the beauty of his former homeland, one that haunted his art career for years to come. Regularly revisiting traditional Asian symbolism and aesthetics through an Americanized eye, this period of Yamamoto’s artistry produced Oriental-inspired paintings and sculptures, as exemplified by the artist’s first two factory-produced designer toys, the all-too-vulnerable “fish out of water” humanoid Koibito and the angst-ridden but potentially hopeful Screaming for the Sunrise dragon bust. Following the success of works like these and his continued growth with the art world, Yamamoto began feeling comfortable creating works that didn’t forthrightly announce his Japanese heritage, ones that were ultimately more organic and uniquely personal expressions. Shifting from koi fish, tigers, and dragons in lieu houses, mountains, and planets with contemplative facial details, it was this new direction that resulted in the artist’s Sideways creation (learn more here) and the subsequent Wish Upon Me… evolution of its conceit. 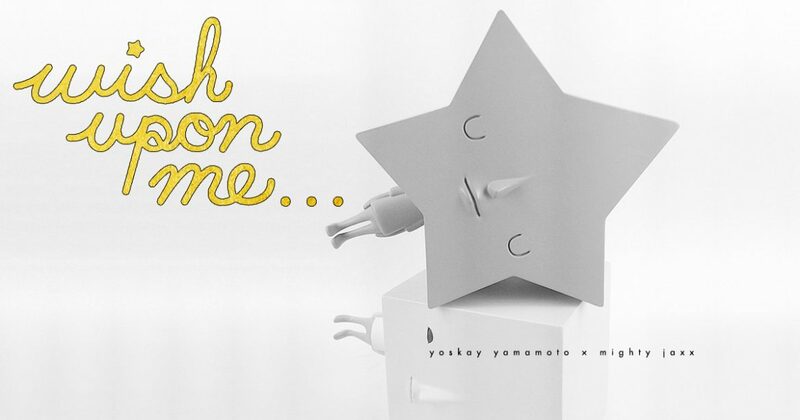 Depicting a falling (or fallen) anthropomorphized star, Wish Upon Me…‘s design debuted as an original sculptural creation at Yamamoto’s House of Daydreamers solo exhibition, which was the artist’s first opportunity to truly transform a gallery’s physical space into a world unto itself, one that captured a state between dream and reality. With the first hints of its factory-produced form being teased a little over three months later, followed shortly thereafter by a painted rendition of the character in another solo exhibition, the Mighty Jaxx issued limited edition debuted in the final month of 2014. With three further colorations offered in March and April of the following year, the last version to be made available had decoration inspired by the famous daredevil Evel Knievel, an unflinchingly brave stuntman who is known to have taken quite a few falls throughout his career. And perhaps this was a truly appropriate place to end the Wish Upon Me…‘s production, a depiction that reminds viewers how a fallen star may not be dead but rather able to rise and shine again.